We all share a common destination. $18.031 million on 3155 screens. 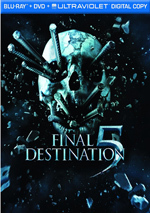 When the 2009 film came titled The Final Destination, one might’ve assumed that it was meant to be the last entry in the series. Otherwise, why not just call it Final Destination 4? The Final Destination appeared to connote an end. Yeah, right – and we believed that Freddy’s Dead would be the last Nightmare on Elm Street flick and The Final Chapter would offer the conclusion of Friday the 13th, too. Fool me once, shame on you – fool me 97 times and I’m a moron. The Final Destination wasn’t a major hit, but it pulled in $66 million, which is more than respectable for something in its genre. I guess that was enough to guarantee Final Destination 5, so it arrived in the summer of 2011. On the way to a company retreat, Sam (Nicholas D’Agosto) has a vision in which a bridge collapses and everyone on his bus meets a grisly demise. When he snaps out of his premonition, he warns everyone to abandon the bus. Some follow, and some don’t, but the ones who get out manage to survive. For a while, at least. As we learned in the first four Final Destination movies, you can only cheat death for so long. One by one, the survivors of the bridge collapse die in unusual ways. We follow these fatalities and wonder who – if anyone – will survive. Like flicks in the slasher vein, that’s part of the attraction with any Final Destination, as we guess who will make it to the end of the story. However, we don’t really care, as the characters receive such insignificant development that they never earn our attachment or interest. Besides, we can guess who’ll last anyway. We know the jerkier characters will buy it before long, and others just smell of “supporting part” so much that their deaths become inevitable. The films attempt occasional surprises to break this trend, but they don’t do much to change up matters. This is because the filmmakers know the real attraction here comes from the bizarre methods of death. The characters don’t buy it in simple ways; instead, they go in ways that would make Rube Goldberg proud. These can be clever but they’re also maddening; they require so many coincidences and mishaps to occur that they provoke as much eye rolling as horror. Given that this is the fifth film in the franchise and it’s likely prospective viewers know what to expect, it becomes more difficult to regard the absurd nature of the deaths as a true flaw. I suspect the Destination franchise has entered “preaching to the choir” territory; the flicks are made to appeal to a core base of fans, and any other viewers count as gravy. And that’s fine, as long as we assume the established fans really do enjoy what they see. As for me, I think the series comes with a clever premise but the combination of the ridiculousness and the franchise’s fatalistic nature tend to be a turnoff for me. It’s not a spoiler to say that no one survives Destination 5. I’m pretty sure that’s the series’ MO, so you shouldn’t expect anyone to experience a happy ending. Would it really be so awful to let someone survive every once in a while, though? Maybe – perhaps that MO is so well-entrenched that any change would look like a cop-out to the fans. For me, though, I find it depressing, and it makes the movies less interesting. If I know everyone’s going to die, it becomes impossible to invest in the stories. There’s no drama or tension if we’re aware that each character will end up six feet under; if the only excitement comes from the complicated ways in which they perish, then I think the film’s in trouble. Destination 5 does throw in a minor curveball when the characters apparently learn a way to cheat death, though again, it loses some effectiveness because we know it won’t work. That’s the inherent problem with the franchise. It’s so fatalistic that we never buy into the characters’ attempts to survive; no matter how good they sound, we’re fully aware they’ll fail. Many horror franchises are repetitive, but the Final Destination flicks appear to suffer from this problem more than most. Final Destination 5 manages a few interesting moments, and I must admit I like the twist that comes at the very end. However, too much of the movie seems predictable and inevitable. Final Destination 5 appears in an aspect ratio of approximately 2.40:1 on this Blu-Ray Disc. I felt totally pleased with this terrific transfer. At all times, sharpness looked excellent. The movie demonstrated exceptional definition, as it showed consistent accuracy and tightness. Jagged edges and shimmering failed to appear, and edge haloes remained absent. Source flaws also caused no distractions. Although modern horror movies usually favor highly stylized palettes, Destination stood as an exception. For the most part, the film went with a fairly natural palette that favored a mild amber tint. The hues looked full and rich within those parameters and seemed solid. Blacks were dark and tight, while shadows demonstrated good clarity. I thought the image looked smashing. The DTS-HD MA 5.1 soundtrack wasn’t quite as strong, but it seemed pretty good. The mix came to life best during the scenes that focused on the complex kills. The disaster on the bridge used the spectrum to involve us in the horror, and the subsequent death scenes also worked the various speakers to flesh out the scary action. All five speakers delivered a strong sense of place and action. Audio quality was always solid. Music sounded full and dynamic, while speech was concise and natural. Effects displayed positive accuracy and range, with nice clarity and power. This was a consistently involving and effective track. Only a handful of extras fill out the set. Circle of Death goes for five minutes, 39 seconds as it provides comments from writer Eric Heisserer, producer Craig perry, director Steven Quale, special makeup effects supervisor Toby Lindala, stunt coordinator JJ Makaro, and actors Nicholas D’Agosto, Emma Bell, Miles Fisher, David Koechner, Arlen Escarpeta, Jacqueline MacInnes-Wood, Ellen Wroe, and PJ Byrne. “Circles” looks at connections to other Destination flicks, story and effects, and the movie’s deaths. We get a few decent details here, but don’t expect much from this short featurette. Also, you should avoid it until you’ve seen the film, as it spoils quite a lot of moments from Destination 5. A pair of Alternate Death Scenes fill 15 minutes, 47 seconds. The first shows Isaac’s demise (10:26), while the second depicts Olivia’s end (5:21). These clips almost literally duplicate what we see in the final film, as they include a substantial amount of pre-killing footage. I’m glad the Blu-ray plays them out in their entirety, though, as that format allows you to see the deaths in context. Two Visual Effects of Death featurettes finish the set. We see “Collapsing Bridge” (9:16) and “Airplane Crash” (3:02). These offer split-screen material; on the top we see production dailies, while the bottom shows the final film. This allows us to compare the raw footage to the post-effects material. It’d work better with some commentary to explain the work, but it’s still an interesting way to see how the end product differs from the original photography. The disc opens with an ad for A Clockwork Orange. No trailer for Destination pops up here. A second platter provides both a digital copy of Destination for use on computers or digital portable gadgets as well as a DVD copy of the film. This delivers a barebones package, so don’t expect any extras on the DVD. Has there ever been a movie series with as dark and hopeless a worldview as Final Destination? I doubt it, and that factor makes the flicks turn into a drag at times. Destination 5 enjoys a smattering of clever moments but its predictable nature and fatalistic tendencies strip away many of its positives. The Blu-ray boasts outstanding picture and very good audio but it skimps on supplements. This is a worthwhile purchase for established Final Destination fans but newbies should probably pass on it.